I love nature and what it allows me to learn in every moment. After having had a very beautiful meeting via Skype with an amazing friend, I was sitting on the terrace and I felt such an inner warmth and stillness. I decided to enjoy the wonderful morning by going for a short walk to admire the landscape, the golden morning sun, and let this joyful feeling sink in deeper. 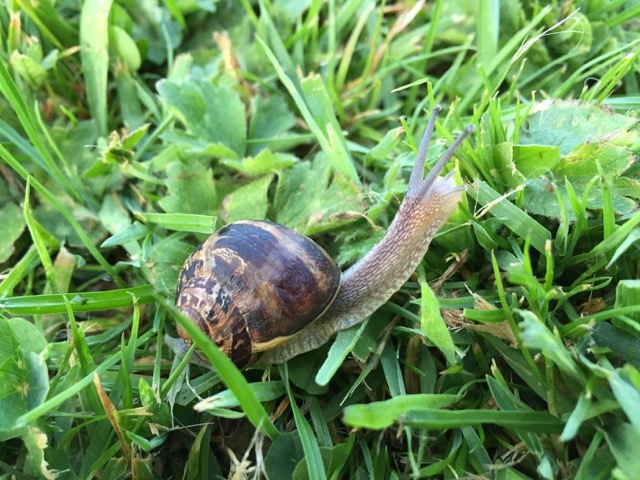 After a few metres I suddenly saw a snail, which was graciously gliding through the grass. I could feel a stillness, beauty and clear focus in those movements that felt very similar to what I felt in myself. It seemed to be so full of joy gliding through the meadow, just living each moment, without a goal to be reached or something to be fulfilled, just living and being. Now and then nibbling some leaves to nurture itself, constantly stretching out its feelers to feel its surroundings. When seeing the ease with which this snail carried its home and how solid that home seemed, I had a deep realisation of the fact that my home is also always with me. It is not made of brick and walls, but a place of trust, love and inner knowing that I carry with me, deep down inside of me. It is light and yet the safest and most solid place I can imagine. I can always go there to be warm and to nurture myself and I do not need to be provided for with anything from the outside, as everything I might really need will be ‘at home’. The striving for goals and the expectations I have had towards life suddenly seemed like a big distraction from the ease and stillness I could feel, if I would be constantly aware of the fact that my home is always within. It feels like I just need to allow myself to go there more often. This little snail has been an amazing reflection and inspiration… of coming home to my soul, my inner wisdom, and to my inner-heart. Stop moments are such a joy and when we deepen these repose-full moments the magic is all around, all we have to do is be aware. Your blog Michael has made me think of the hare and the tortoise story, as everyday I am wrestling with my habitual rush and push that undermines that poise, stillness and gracious gliding movement that you observed in your snail. We can learn a lot by observing and appreciating nature. A great lesson from nature that when we rush we are going nowhere but when we return to the love of our inner-heart we know we are at home. Realising that one’s home is always with(in) oneself, wherever I go it brings a solidity and foundation with which to travel through life. A simply gorgeous sharing Michael, a magic moment, showing that all nature is there to provide us with loving reflections as with the snail carrying its home, as we carry our own home deep within us. Being able to go anywhere without leaving home – sounds like a bit of a conundrum, but that is how we are made to travel. Warmth, stillness, light, playfulness, joy, divine order, infinite beauty, tenderness…all these qualities are our true home, why are we not there more often? I love how nature is constantly sending us messages, to be open to receive this magic of God is a great blessing for us all. Thank you Michael. I can feel the same message the snail reflected, that all the ease and grace in the world is waiting in our inner hearts, a place that is the true home we originate from. We can only return home if the quality we are in the world allows it. A beautiful reminder to stay connected and aware of what is around us rather than racing through life being oblivious to what is in front of us. Re-reading this blog today is a beautiful reminder that we are enough just as we are, there is nothing to push or strive for, only to return to knowing that our true home is always with us deep inside. “This little snail has been an amazing reflection and inspiration… of coming home to my soul, my inner wisdom, and to my inner-heart”. It is inspiring to observe how in nature all move impulsed and powered by an inner vibration that represents all that is to be lived, by the pulse that gives it life, never questioning simply being all that it is designed to be. This is real freedom, and this is what we also have the opportunity to live, being impulsed by our Soulful light so our movements reflect the quality of our essence, with awe. I cannot even imagine a lonely snail. Complete in every way, it feels need-less and we too can be complete and need-less if we connect to the majesty that is within. Reading this blog made me appreciate that the smallest thing on this planet has a purpose and constantly reflecting to us that God’s creations are all around us. If we just stand still and observe it just for a moment. Same for me Shushila. I find stopping to appreciate what nature reflects to us is a great way to also appreciate that we are all deeply connected to everyone and everything around us. Yes, Michael has given us here a beautiful reflection of the constant magical communication of God, it is just whether we are willing appreciate and receive it.